Greater Sydney's Eastern Economic Corridor (refer to Figure 40) has high concentrations (agglomerations) of jobs with good road and public transport connectivity, which allow high levels of interaction between businesses and people. The economic benefits of the agglomeration of activities in this corridor are reflected in its contribution of two-thirds of the State’s economic growth over the 2015–16 financial year. This Plan seeks to further strengthen the economic opportunities of this corridor and plan and develop a new Western Economic Corridor and the GPOP Economic Corridor. major industrial areas of Artarmon, South Sydney and Marrickville which provide essential trades and services that support specialised economic activities. The committed Sydney Metro Northwest and Sydney Metro City & Southwest will extend the reach and capacity of the existing rail network to Rouse Hill and significantly enhance the accessibility to, and between, approximately a million jobs which will exist between Rouse Hill and Sydney Airport by 2036. The committed NorthConnex will, among other wider benefits to Greater Sydney, improve accessibility to Hornsby and the Central Coast. The committed CBD and South East Light Rail will improve connections to the health and education precinct at Randwick, and better connect it into the corridor. The potential Northern Beaches to Chatswood bus improvements will better connect the major new Northern Beaches Hospital at Frenchs Forest and the Northern Beaches with the corridor. A potential mass transit link from Parramatta to Epping would significantly improve the connection between Greater Sydney’s (and in fact Australia’s) two largest suburban centres of Macquarie Park and Greater Parramatta. Green Square Town Centre Project, where Landcom is a major landowner within the town centre and the lead agency collaborating with key stakeholders on one of the most significant transformation programs in Greater Sydney. 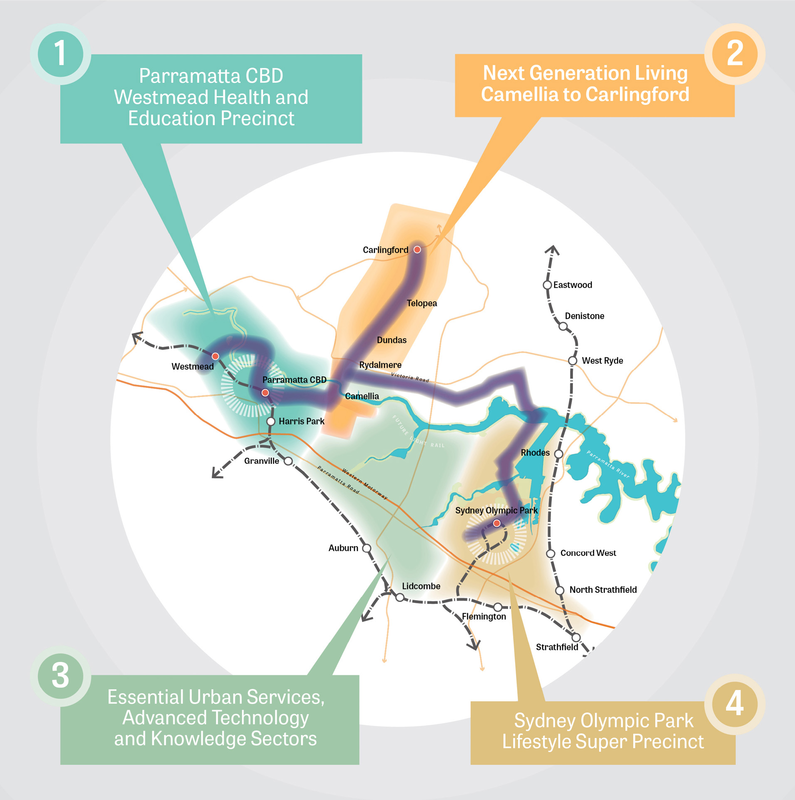 In 2016, the Greater Sydney Commission commenced work on its first Collaboration Area – Greater Parramatta and the Olympic Peninsula (GPOP) which involves councils and multiple State agencies co-creating a vision for GPOP. It is the first Collaboration Area where a growth infrastructure compact will be piloted (refer to Objective 2). Sydney Olympic Park Lifestyle super precinct. The economic activities form a corridor from Westmead to Sydney Olympic Park (refer to Figure 40). GPOP is integral to the vision of A Metropolis of Three Cities and the Central River City. 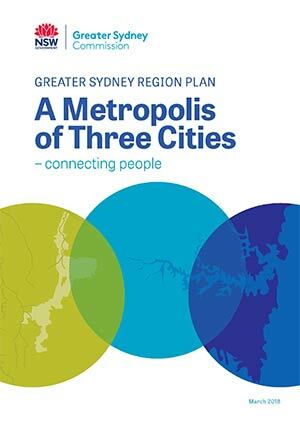 The transformation of GPOP will assist in rebalancing opportunities across the Greater Sydney Region. GPOP is envisaged to become Central City’s connected and unifying heart. Both the Parramatta Light Rail and the Sydney Metro West will be catalysts for realising this vision. New radial connections will also be essential. Sydney Metro West has the potential to significantly enhance Greater Parramatta’s inter-city link with the Harbour CBD through improved journey times and frequency of service. Improved transport connections within GPOP and to the nearby strategic centres would deliver the economic benefits of agglomeration including enhanced opportunities for business-to-business interactions and access to larger skilled labour pools. Transport connections have the potential to create a cluster of economic activity with up to 370,000 jobs within a 10–15 minute public transport catchment. Equally important is the creation of high quality, new places for people to enjoy a more urban lifestyle. Parramatta CBD is the first of these. Source: Adapted from Greater Sydney Commission 2016 GPOP Vision. reinvent Sydney Olympic Park and surrounds as a place that inspires a lifestyle of wellbeing, healthy activity and celebration in a unique setting that attracts allied and like-minded business. An interim planning framework to deliver this vision has been outlined by the NSW Department of Planning and Environment. This includes an Interim Land Use and Infrastructure Implementation Plan across a range of precincts, a program for the development of a Special Infrastructure Contribution and further precinct investigations. The GPOP collaboration is looking to wider opportunities to improve liveability outcomes that maximise benefits in the surrounding areas such as more walking and cycling paths and greater collaborations with Land and Housing Corporation. The Australian Government’s investment in the Western Sydney Airport and participation in the Western Sydney City Deal (refer to Objective 5 and Objective 20) will see the emergence of a new international airport for Greater Sydney and the Badgerys Creek Aerotropolis. These new economic agglomerations, together with planning and delivering a transport network to support the significant projected population growth, create the opportunity for a potential northsouth train corridor which can act as a catalyst for a Western Economic Corridor (refer to Figure 40). planning for the alignment of the Outer Sydney Orbital, including integrating land use activities with this intra and inter-regional transport connector. The delivery of a new Western Economic Corridor is integral to the approach of creating more jobs and a diversity of jobs in the Western Parkland City (refer to Objective 20) and the metropolis of three cities. A range of strategies support the delivery of the economic corridors. In addition to enhancing accessibility within the corridors, growing investment and businesses in centres and trade gateways is fundamental to their ongoing success. Objective 22 outlines how the Plan seeks to grow jobs in Greater Sydney’s centres and Objective 16 provides similar guidance for trade gateways. Prioritise public transport investment to deliver the 30-minute city objective for strategic centres along the economic corridors. Co-locate health, education, social and community facilities in strategic centres along the economic corridors. The Greater Sydney Commission to continue leading the collaboration of councils, State agencies, businesses and the community to deliver the GPOP vision. Being the connected and unifying heart of the Central City, GPOP is being championed as a place for new businesses, homes and services; for diverse employment; for walking and cycling; and to facilitate spaces for arts and culture. The Greater Sydney Commission to coordinate, seek expertise and insight from councils, State agencies, businesses and the community to develop a growth infrastructure compact for GPOP by December 2018. The growth infrastructure compact will outline the sequencing and funding of local and regional infrastructure aligned to growth.